Indian motorcycle market saw an increase in the demand for powerful quarter liter and even 200 cc options in the recent times. The availability of KTM Duke 200 at INR 1.51 lakh (ex-showroom Delhi) was once considered a benchmark while new entries into the nearby segment disturbed its sales by a considerable margin. The most recent addition to the competition was a slightly bigger, 250cc Yamaha FZ25. It came with an even more impressive price tag of INR 1.19 Lakh and had goodies like LED headlight, 43 kmpl of claimed mileage and even 148 kg of lightweight body. This made it good for a tough competition as oil cooled engine even produces 20.69 BHP at 8000 rpm and 20 Nm at 6000 rpm. If this even feels a bit over your budget, Bajaj Pulsar NS200 comes with the same engine size as KTM 200 Duke. The 199.5 cc, single cylinder engine is good for 23.17 BHP and 18.3 Nm of torque. The engine comes mated to a 6-speed gearbox while the price for the same is INR 1 Lakh. NS200 is now also available with 1-channel ABS for INR 1.12 Lakh (Ex-showroom Delhi). TVS Apache RTR 200 is the most affordable motorcycle in this segment, carrying a price tag of INR 97,000. The motorcycle uses a 197.75 cc, single cylinder engine producing 20.23 BHP and 18.1 Nm of torque. It even weighs 148 kg and claims a 12 second 0-100 kmph sprint. TVS recently also launched the Fi and ABS models of RTR 200 for INR 1.10 Lakh & INR 1.11 Lakh respectively. 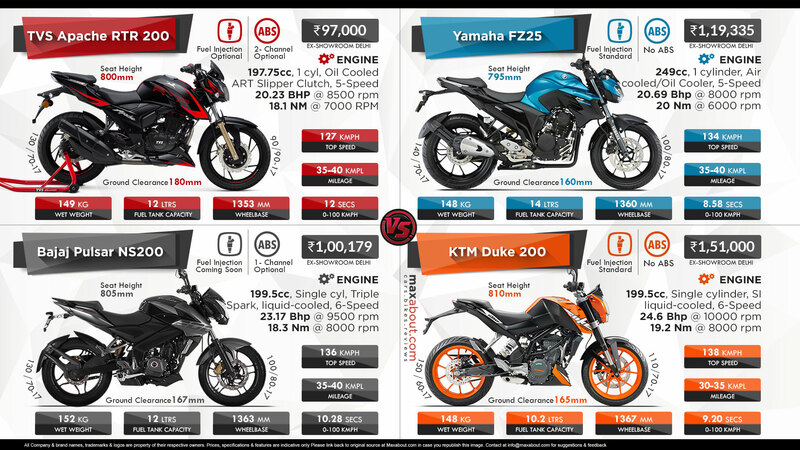 Yamaha FZ25 comes out to be the fastest when seen in acceleration figures while KTM Duke 200 claims the highest top speed among all other in competition.